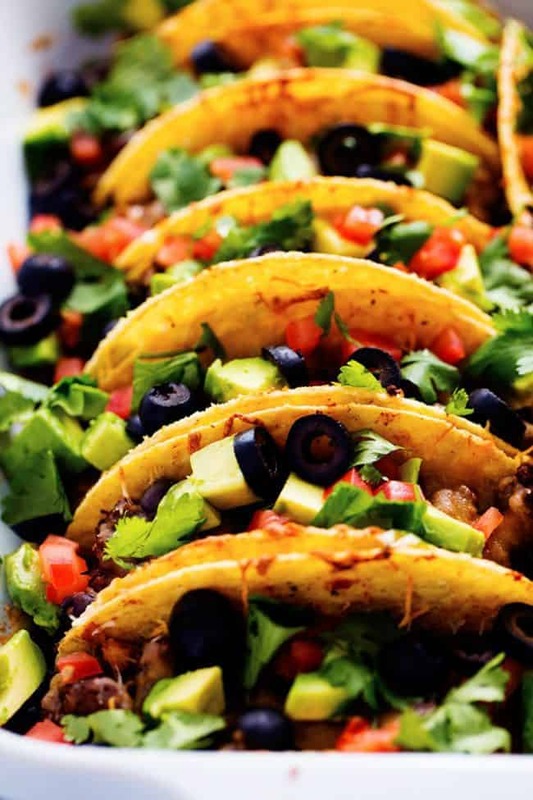 Beefy Baked Tacos are ready for the dinner table in under 30 minutes! 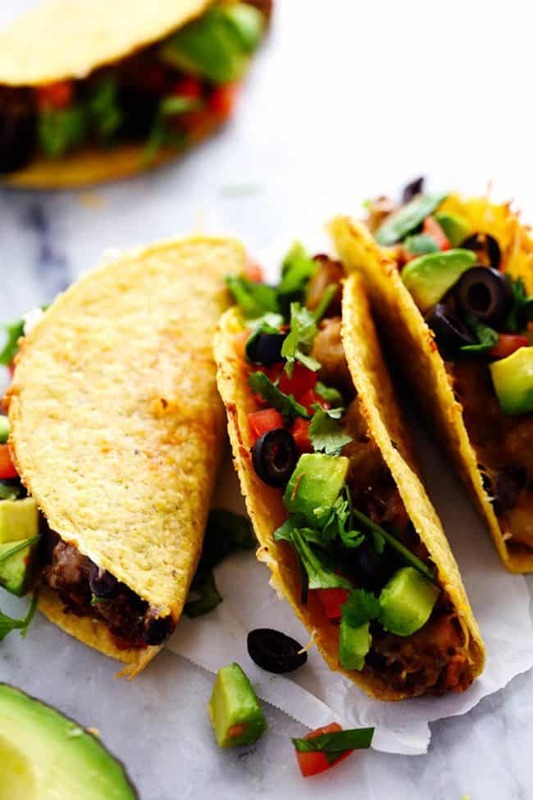 They are layered with refried beans, a black bean taco seasoned ground beef and topped with melty cheese. Load them up with all of your favorite toppings and your family will devour them! Do you ever make something and wonder where it has been your entire life? This is that recipe. I have seen baked tacos done before but why have I not tried them until now? My family has been missing out. These really couldn’t be easier to make but are packed with so many incredible flavors. They get a layer of refried beans on the bottom followed by a black bean taco seasoned ground beef. Then topped with melty cheese….. ohhhhh yeah! 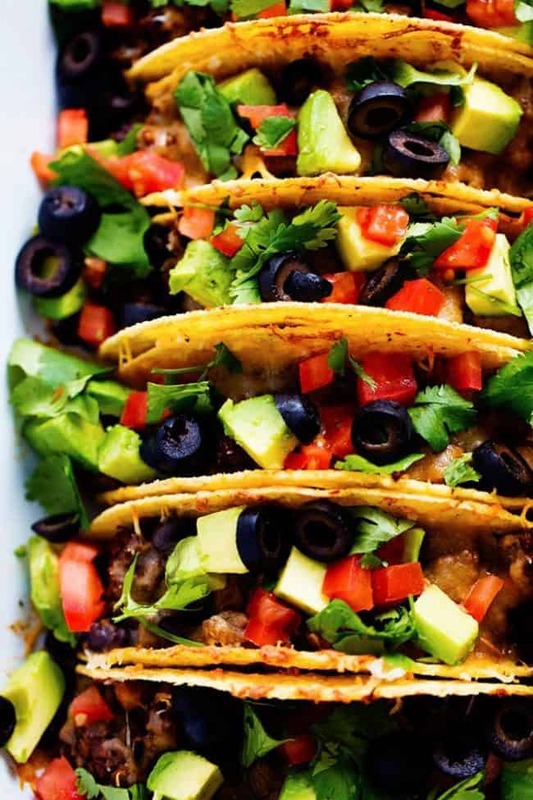 Then the best part about these tacos are that you load them up with all of your favorite toppings. I am an avocado, tomato, olives and cilantro kind of girl. But you can add as many toppings as your heart desires. Add a dollop of sour cream or even some jalapeños for some kick! With life as busy as it is at our house you better believe these are happening every week. My family DE-voured them! They are the perfect thing for busy nights and are perfect in the warm corn tortilla shell with all of the yummy layers of flavors inside. Once you make them once you will want them again and again! Preheat oven to 350 degrees. In a medium sized skillet brown the ground beef and drain. Add taco seasoning, black beans and tomato sauce. Let simmer for about a minute. 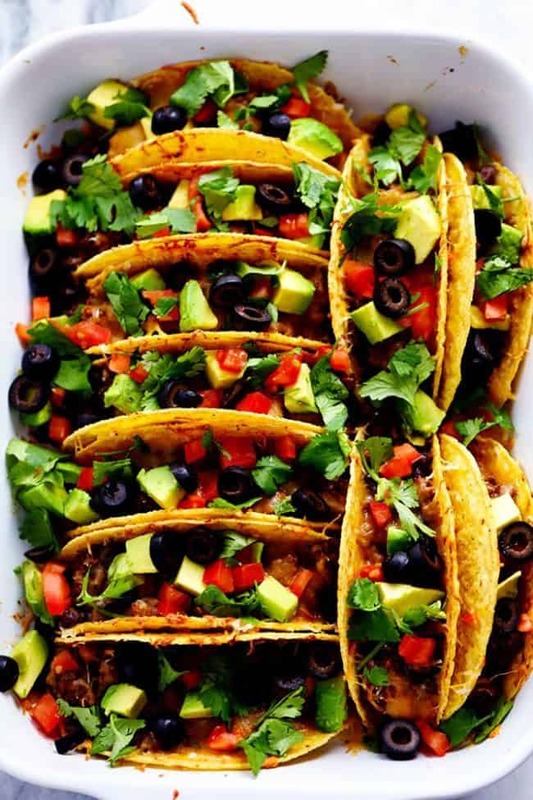 Layer the taco shells in a 9x13 inch baking dish. Add about 2 tablespoons of refried beans to the bottom of the shells. 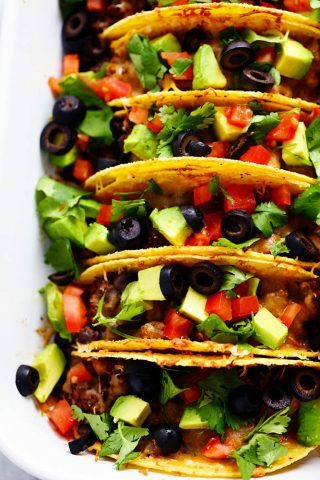 Add the ground beef mixture and divide evenly among the taco shells. Top with cheese. Bake for 15 minutes until lightly brown and heated throughout. Top with favorite toppings. Hey girl I love food like this! Yummy! I have tried a similar version of this recipe, Iam going try your recipe soon.